Africa intrigued me from a young age. I was born in the Netherlands. I attended Arts Academy in Arnhem, where we were taught to produce art in a structured manner. We had to adhere to certain methods of expression. Planning ideas and concepts before creating the work of art. After Arts Academy I travelled extensively with my husband, Henri. We worked in Zambia for five years for SNV, developing a carpentry and leatherwork enterprise. Since 1994 we live in Arusha, Tanzania. We adopted two children, Romana and Remi, now 18 and 13 years old. In 2004 I travelled to Zimbabwe where I realized an intrinsic desire to sculpt and create with my own hands. Since that moment I have been sculpting in stone. It touches a part deep inside me, it connects the outside world to my core. It reveals what’s otherwise hidden. I found that each stone had a story, a natural shape which connected to something deep in my subconscious. At first I saw faces in the raw stones, but never realistic , they developed whilst carving. They were all happy faces, with a strong energy,radiating to the people who bought them, as if they recognized a part of themselves in it. After carving almost 50 faces, I felt the need to create more of a human form in the stone. This was a bit of a struggle as the head broke at the neck many times. I realized it is a natural exchange of energy, an organic communication, between the stone and the artist, creating. I was only able to concentrate on torso’s for a while. Later the torso’s became more abstract and had their own story, mimicking the forms of African women, strong and grounded. The strong bends in the back seemed to push the energy from the earth into the universe. My abstracts had names like “energy through stone” , “energy spreading out” and “exploding heart”. These sculptures were still related to parts of the body. Since 2013 my sculptures ask more from the viewer. They have become abstract forms , resemblances of the real world but leaving much to the imagination. The sculptures are a way to communicate and exchange universal energy at another level. I love to work, teach and collaborate with musicians, dancers, writers, anyone who is open to develop their unique creative expression. 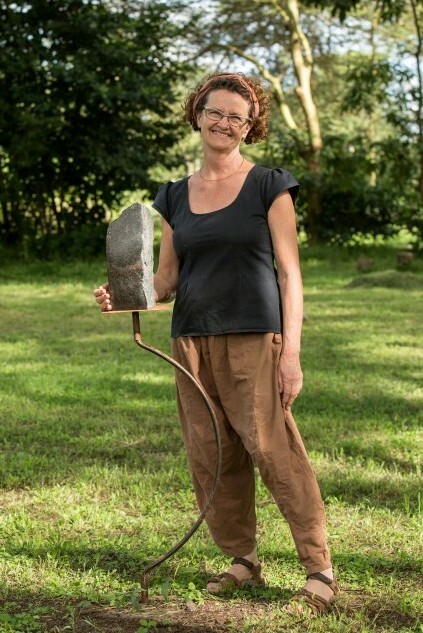 My sculpture garden in Arusha Tanzania is a tranquil space between habitation and nature. Birds call in the background, small trials lead people from one sculpture to the next. Imaginations are free to wonder, My art is created organically, inspired by the tranquility of nature, the songs of birds, the splash of light through yellow fever trees.